Last year, I purchased a few 3oz little candles from Virginia Gift Brands just to test out fragrances. These are cute little candles and perfect to burn in small bathrooms… and a perfect size to review for those who love smaller candles. The clean scent of a fresh ocean breeze is brought to life along with hints of luscious tropical fruits and delicate floral notes. Smelling the wax for the first time… it was fresh and airy and smelled exactly like the description. Clean, sweet and fresh but feminine which must have been the floral notes. I liked it a lot and I’m not a fan of floral. I stuck to a small bathroom to burn this candle due to its size and oh my goodness, it was perfect in a small room! Once lit, the aroma started filling the room within minutes of lighting it. The scent was light but so pretty and smelled just as it did when I first popped off the lid. A sweet and fruity floral scent that smelled so fresh and clean. The fragrance kind of reminded me of soap. And I’ll say this again… it was perfect for a bathroom!! I loved it!! Strength – on a scale of 1 to 10, I would rate this candle a 6 in a small room. I wouldn’t burn this size in a larger room or the scent would be lost… unless you just want to burn it simply for the sound effects. Now that was cool! Every time I walked into my powder room… the crackling blow torch sound was ever present and always made me smile. My candle burned perfect. Zero issues. I really enjoyed Tradewinds and would definitely purchase it again. Loved it for my bathroom as it added a fresh and clean vibe, something I’m always striving for in those particular rooms. I do love Wood Wick candles… they’re so cool and different to burn when I’m in the mood for something unique. It’s the sound effects that always pulls me in. I’m not seeing this scent on Virginia Gift Brands website right now but it is available through other online outlets and stores. I’ve seen it all over the place. 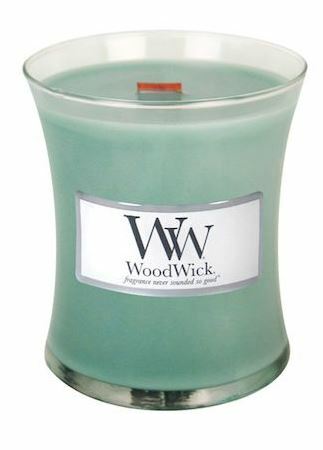 Have you tried Tradewinds Wood Wick candle from Virginia Gift Brands? Review it with us. In the comment section below, review and star rate your experience… it’s easy!